Edward Snowden, who revealed classified details about the American National Security Agency’s surveillance program, has reportedly been stranded in the transit zone of Russia’s Sheremetyevo airport for the past two weeks. While Snowden applied to multiple countries for refuge, Venezuela is one of the few nations that have offered him political asylum. If Snowden accepts asylum in Venezuela, it is likely to further strain relations between the U.S. and that host country. According to a new Pew Research Center poll, worsening ties with America is something the Venezuelan public wants to avoid. A plurality of Venezuelans (44%) prefer to have a closer relationship with the U.S. than existed during the presidency of Hugo Chavez. About two-in-ten (21%) want to maintain a similar relationship with their northern neighbor as they have had in the past, and 23% want the relationship to be less close. There are wide partisan differences on this issue. 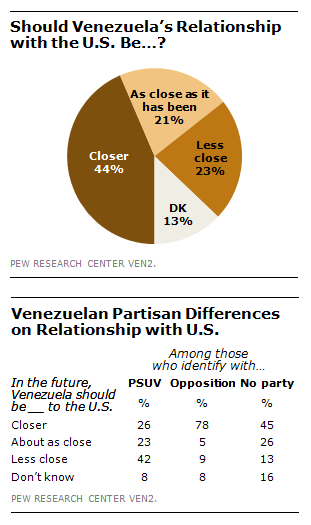 A plurality of Venezuelans (42%) who identify with Chavez’s party – the United Socialist Party of Venezuela (PSUV) – want an even more distant relationship between their country and the U.S., 23% want it to be the same as it was under Chavez and 26% want it to be closer. Meanwhile, a broad majority (78%) of those who identify with one of the many opposition parties want a closer relationship with the U.S., as do a plurality of those who do not identify with any party (45%). More broadly, according to the survey, which was conducted shortly after Chavez’s death, a slim majority of Venezuelans (55%) think it would be a good thing for their country if the new president continues Chavez’s policies while in office. About three-in-ten (29%) say this would be bad for Venezuela and another 9% believe it would be neither good nor bad. Again, there is deep partisan polarization on this question. While nearly all of those who identify with the PSUV (96%) say it would be good to continue Chavez’s policies, just 14% of those who identify with the opposition parties agree. And Venezuelans who claim no party allegiance are split – 39% say it would be good and 36% think it would be bad to follow Chavez’s line.